When we get asked the question about what BBQ to buy, the question we ask back is ‘What is your budget’? This can determine what BBQ you get recommended. With BBQ’s the the old adage of ‘you get what you pay for’ is generally spot on. However, you do not have to spend a fortune when buying your BBQ equipment. Ady (@8t8 on Twitter) is one of the core members of the BBQ Community who are behind the UK BBQ Week initiative. He had a great idea to see how he could purchase all the essentials required to BBQ, at the cheapest price. This section of the website is going to follow Ady on his journey and see how he gets on through UK BBQ Week. The overall aim is to show everyone you don’t have to spend a fortune to be able to cook good food and enjoy BBQ. Ady embarked on his quest and fairly early on managed to find an absolute bargain in the sales. 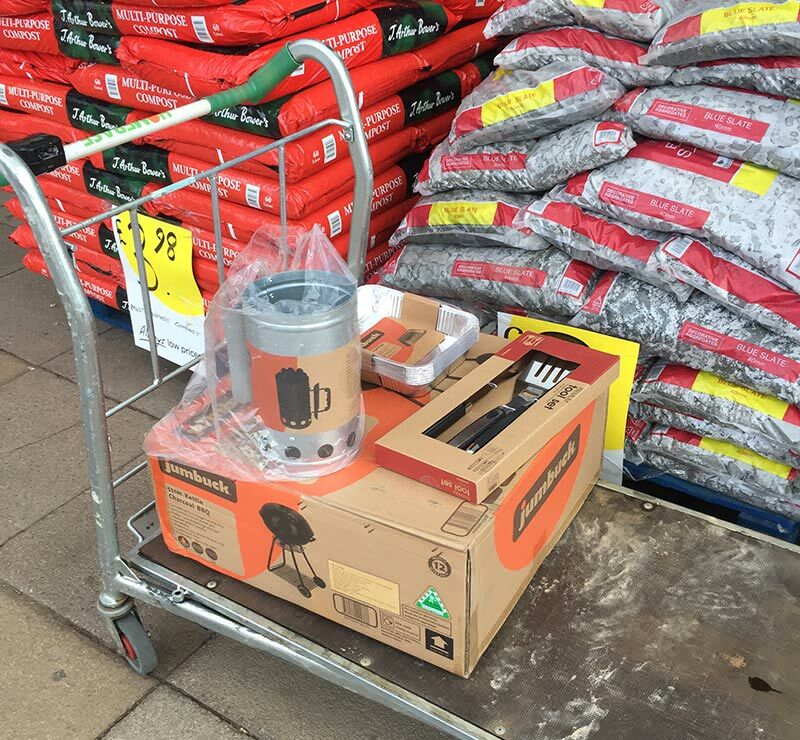 Ady discovered a sale where he managed to pick up a 57cm Kettle BBQ for £29…..an absolute bargain and a great start to his shipping extravaganza!!! Again, Ady managed to find all of these for another outlay of £18.91. In total Ady only spent an amazing £47.91, which also included fuel and all the essentials to start having fun with the BBQ. 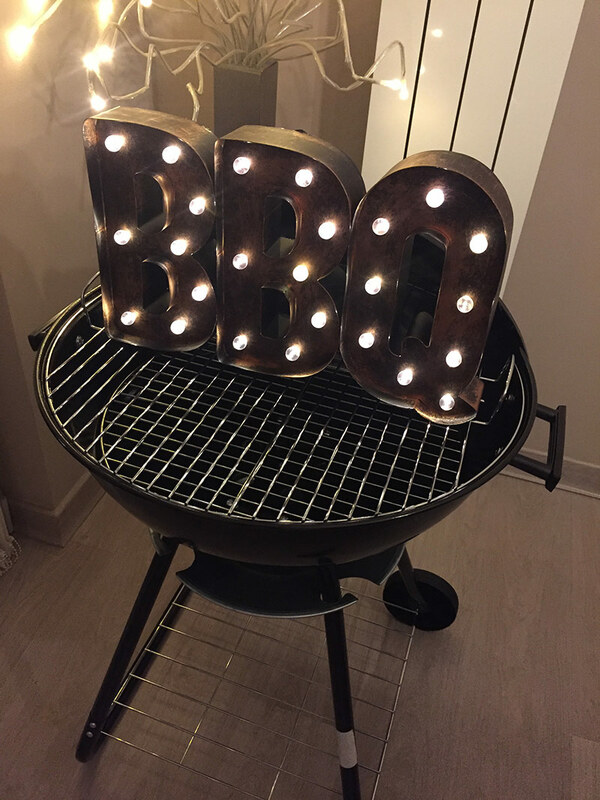 With all the pennies Ady managed to save with his bargain shopping he decided to treat himself to a BBQ accessory, which is by no means an essential item!!!! Next weekend is a chance to win a superb prize by cooking a Sunday Roast on the BBQ. To help with this and give you some inspiration, for the first cook I decided to roast a basic chicken which had been marinaded overnight. Below is my method if you want to try this. Set up for Indirect cooking using a foil tray filled with warm water underneath. Lit the charcoal in the chimney starter using a Eco fire lighter. Pour the hot coals onto one side of the BBQ. Put on the lid and bring the BBQ up to temperature. Place the chicken breast side up oven the foil tray thats underneath the cooking grille. Place lid back on and cook for about 2 hours at 120C / 250F. I used a Maverick temperature dual probe setup but its not necessary. Cook chicken until the internal temperature reads 74C / 165F in the breast. I used a Thermapen Mk4 and can’t rate them highly enough. If you have no way of checking the temperature probe with a skewer until the juices flow clear. Remove when cooked, pop in a tray and enjoy. Overall, the budget 57cm did the job perectly well for the money, only real downside is the bottom air intake easily blocks with charcoal. I’m going to modify it by using a small seive over the vents under the charcoal tray and try again.Keep checking back to read more of my cooks through UK BBQ week.